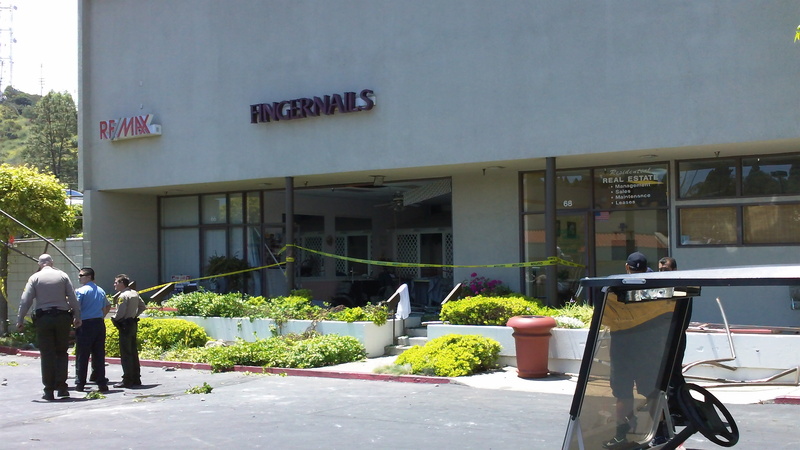 It turns out an elderly woman driving up a ramp in the Rolling Hills Estates parking lot, crashed through a guard rail and went airborne before plunging into this nail salon. 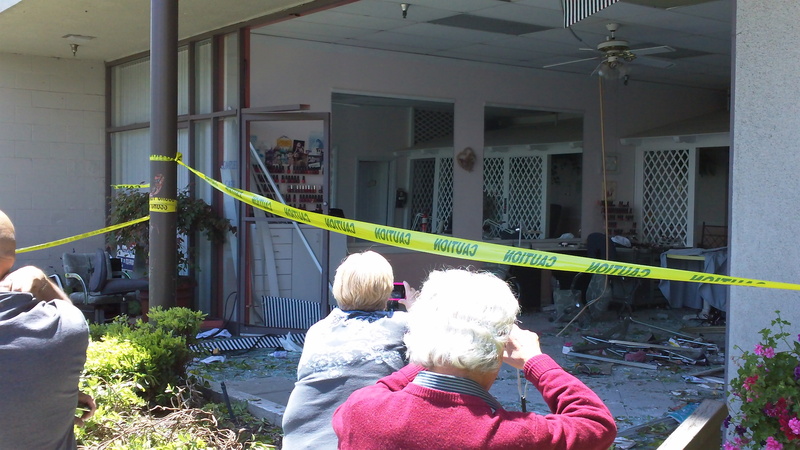 The 2001 Infiniti landed completely inside the Peninsula Center business. Somehow, the woman’s gray Infiniti missed hitting four other people as it embedded itself inside the building. .
From seeing the premises first-hand, it’s remarkable that nobody was seriously injured or even killed! Building and Business Personal Property: Coverage to help pay for the cost to repair or replace property, including inventory, office furniture or fixtures damaged by the accident. Not only is the business covering their own contents, but think about the building owner carrying a policy to cover the building itself. Business Income and Extra Expense Insurance (AKA – Business Interruption Insurance): Coverage that reimburses a business owner for lost profits and continuing fixed expenses during the time that a business must stay closed while the premises are being restored because of physical damage from a covered peril, such as a fire. It also may cover financial losses that may occur if civil authorities limit access to an area after a disaster and their actions prevent customers from reaching the business premises. On the flip side of the coin, let’s hope the driver of the car carried an appropriate amount of liability insurance as you can bet the insurance company for the nail salon and the building owner will be looking to subrogate their losses as a result of the drivers negligence (The legal process by which an insurance company, after paying a loss, seeks to recover the amount of the loss from another party who is legally liable for it). 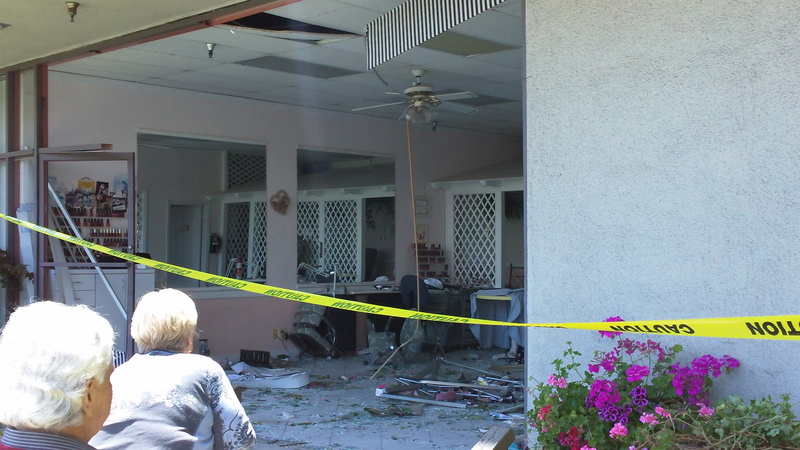 As with any other insured, do you think this business owner ever thought this would happen to them? If you own a business, don’t think it can’t happen to you. Don’t wait to carry business insurance coverage. Cover your business now and always expect the unexpected.